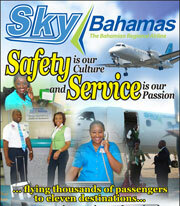 Love is in the Air at SkyBahamas! 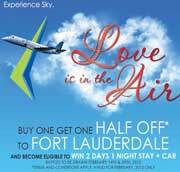 Buy One, get one Half-off * to Fort Lauderdale and become eligible WIN 2 Days, 1 Night and a Car. 'Like' SkyBahamas Airlines on Facebook and be the FIRST person to answer their Trivia question CORRECTLY and could win a $20 Sky Bucks Voucher redeemable for purchases on any of our scheduled flights. SKY BUCKS TRIVIA will be held every Monday, Wednesday, & Friday. 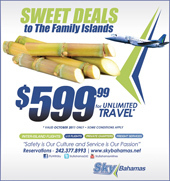 SkyBahamas Airlines as Sweet Deals when flying to the Family Islands! $199.98 Round Trip - Nassau – Ft. Lauderdale Route. 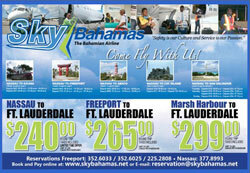 $599.99 UNLIMITED TRAVEL – To any of our DOMESTIC locations. 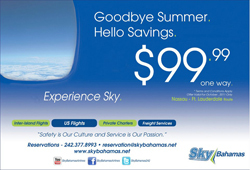 $99.99 One Way from Nassau, Bahamas to Fort Lauderdale, Florida - This October! Experience Sky. $199.98 Round Trip. 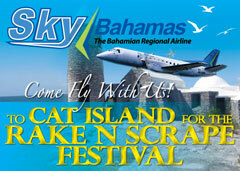 Go NUTS when flying to the Family Islands with SkyBahamas Airlines! 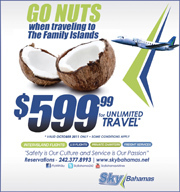 Nassau, Bahamas - Experience Sky unlimited Travel to The Family Islands for only $599.99 to all domestic SkyBahamas Destinations. 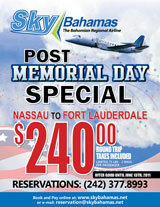 Also available too is unlimited Travel to Ft. Lauderdale from Nassau, Freeport and Marsh Harbour for only $749.99. Both valid September 2011 only, No Blackout Dates Some Conditions Apply. 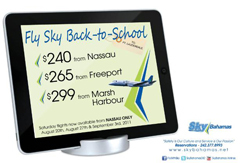 Fly Sky Back-to-School to Fort Lauderdale! The remnants of former Tropical Storm Emily, a surface trough, are producing disorganized showers and thunderstorms from Jamaica northeastward across eastern Cuba, Hispaniola, and the southeastern Bahamas into the Atlantic for a few hundred miles. There are no signs of a closed circulation at this time, and upper-level winds are expected to be only marginally conducive for re-development today. 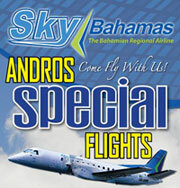 Fly Sky to Andros this Friday, Saturday, Sunday for $60 One Way or $100 Round Trip! Flying thousands of passengers to seven destinations. "Come Fly with us!" 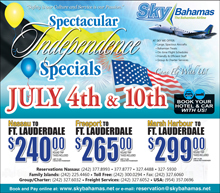 and take advantage of our Spectacular Independence Specials to Fort Lauderdale! Taxes included - Limit 75lbs - 2 bags per passenger.
" 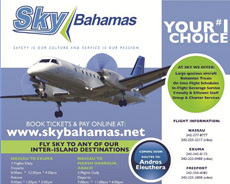 When I Fly, I Fly with Sky"
Book & Pay online www.skybahamas.net or call us. "Come Fly with us!" 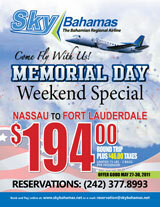 to Fort Lauderdale, Florida from Nassau - May 27 - 30th, 2011 this Memorial Day Weekend for just $194.00 round-trip + $46.00 Taxes - Limited 75lbs - 2 bags per passenger. Advanced bookings are now available! 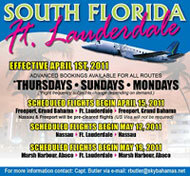 Fly SkyBahamas to South Florida (Fort Lauderdale) effective, April 15th from Freeport, Grand Bahamas, and effective May 12th from Nassau. 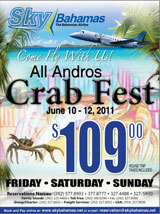 Marsh Harbour Abaco begins May 19th.